I caught this picture the other day when we had so much snow and I love how you can see the tiny little flakes sitting in the branch. It made me think about the reality of no two snowflakes being alike. Each one is a tiny little work of art, made by God. That's incredible! How many snowflakes fell just over the weekend? How many over the winter? How many over the centuries? And none have ever been recreated?! Our God is so amazing. Exquisite thought from one who takes time to notice. Thank You! Sorry I missed today..the whole week was a bust..Snow is really beautiful and I am always thanking God..but I did have a chat with God about this winter..Almost killed me..Thank you for spring..now we have "mud season"..
Beautiful! That is staggering to think of all the unique snowflakes - and all the unique people through the centuries too. God's creativity is boundless! Beautiful photo Beki. And how amazing, just like snowflakes, that God hasn't made any of us exactly alike either! Snow makes me wonder what manna looked like - the bread of angels?! Can you imagine?? 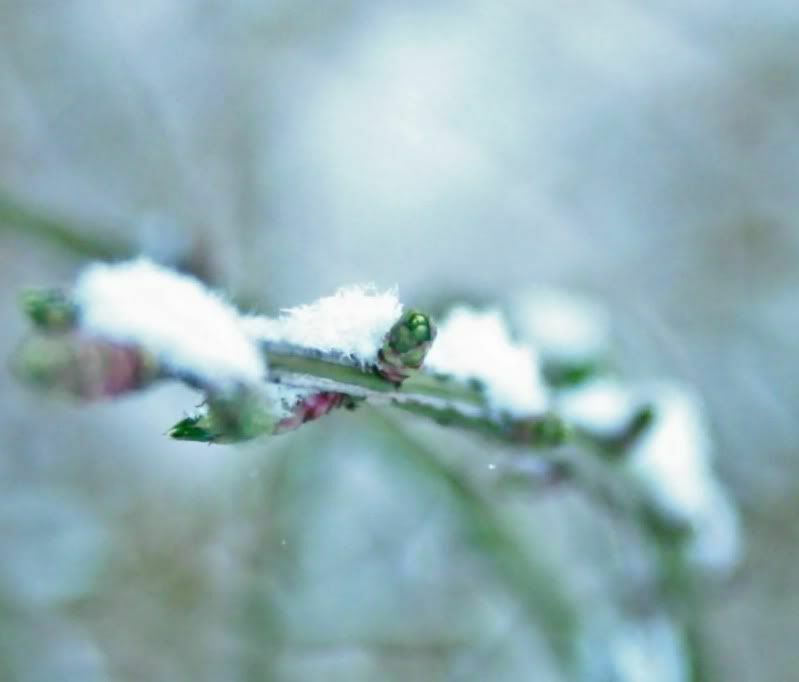 I love the delicate buds ready to sprout and yet the snow is saying "Not Yet!". A really beautiful picture! Thank you for letting me be a part of "Fingerprint Friday". What a great photo! There are no two snowflakes or people alike. Your picture reminds me of the snow that just fell in central Minnesota at the beginning of the week. We were starting to look like spring until the almost 12 inches snow came this week. Beautiful photo and I love that song. His fingerprints are everywhere.